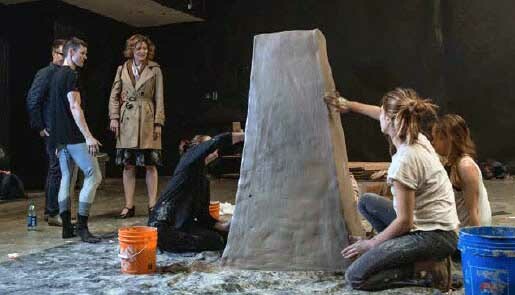 When it comes to international performance artists, it’s tough to top Cassils. 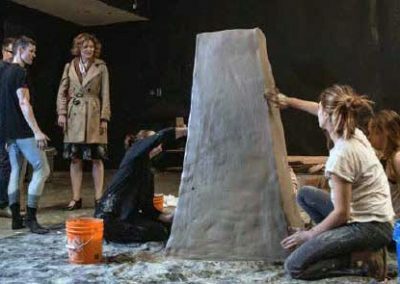 The recipient of a Guggenheim Fellowship, several grants from the Canada Council for the Arts, a Creative Capital Grant, a United States Artists Fellowship, a California Community Foundation Visual Artist Fellowship and the Rema Hort Mann Foundation Visual Arts Fellowship — to name a few of their accolades — Cassils’ work uses their body in a sculptural fashion, integrating feminism, body art, and gay male aesthetics into remarkable public performances that leave a lasting impression. 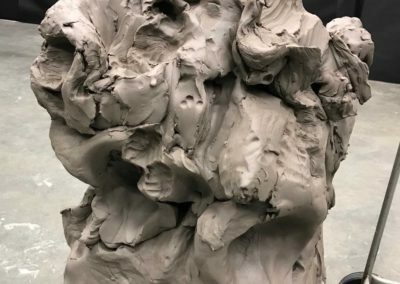 A gender non-conforming and transmasculine artist originally from Montreal, the internationally renowned Cassils is now based in in Los Angeles and was recently the subject of this feature article in Canadian Art magazine. 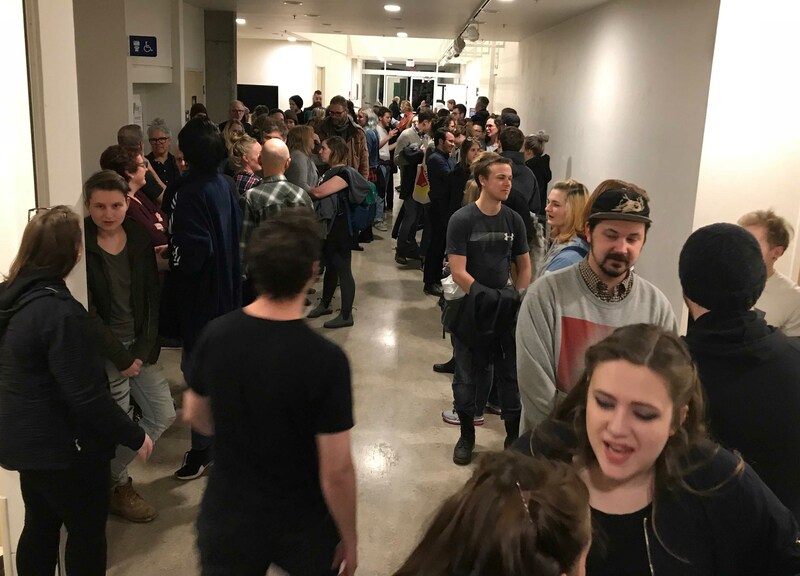 UVic and Victoria audiences were fortunate in March to have had the opportunity to witness their Becoming an Image performance and hear Cassils speak at a public talk as part of the Trans Hirstory in 99 Objects at Legacy Art Gallery Downtown. 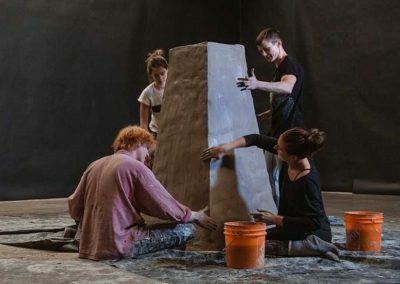 Becoming an Image is a piece that works at the interstices of performance, photography and sculpture, and features the artist delivering a series of kicks and blows to a 2,000-pound clay block over the course of 30 minutes. Originally conceived as a site-specific work for the ONE Archives in Los Angeles — the oldest active LGBTQ archive in USA — it is performed entirely in the dark in a tightly controlled environment, lit only by a photographer’s flash. The March 7 performance in UVic’s Visual Arts building was only the 15th time it had been done since being created in 2012. 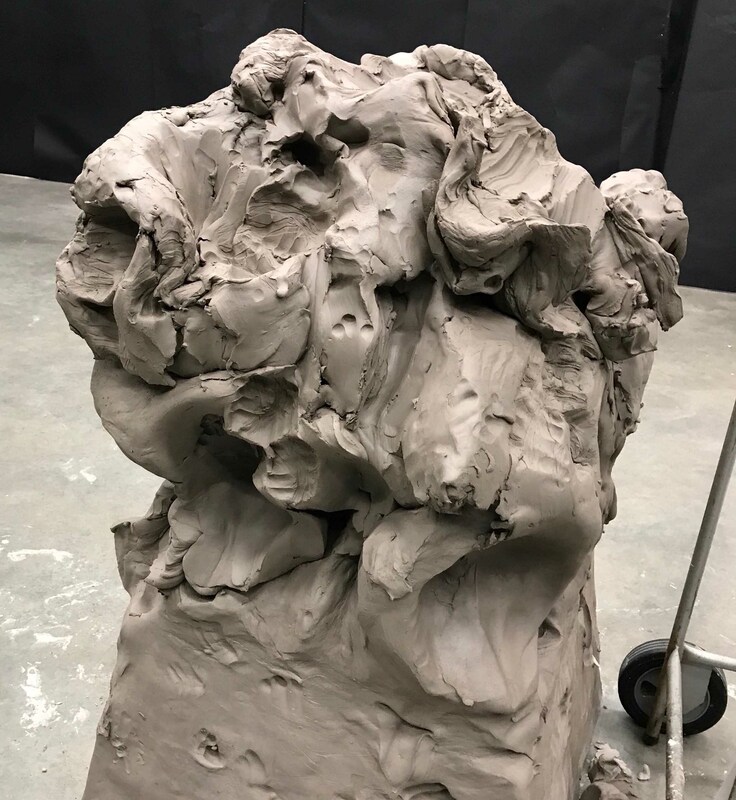 Four Visual Arts undergrad students — Carter Forman, Katrina Brushetta, Stephanie Hedler and Eloise Mason — were fortunate enough to spend a few days learning from and working directly with Cassils while shaping and preparing the clay block. Cassils designed Becoming an Image to push their body to the extreme to evoke the struggle for self-defense and self-preservation against threats of violence and erasure. By performing in total darkness, the illumination from the camera’s flash serves to sear the scene into the viewer’s retina in a manner both haunting and beautiful. 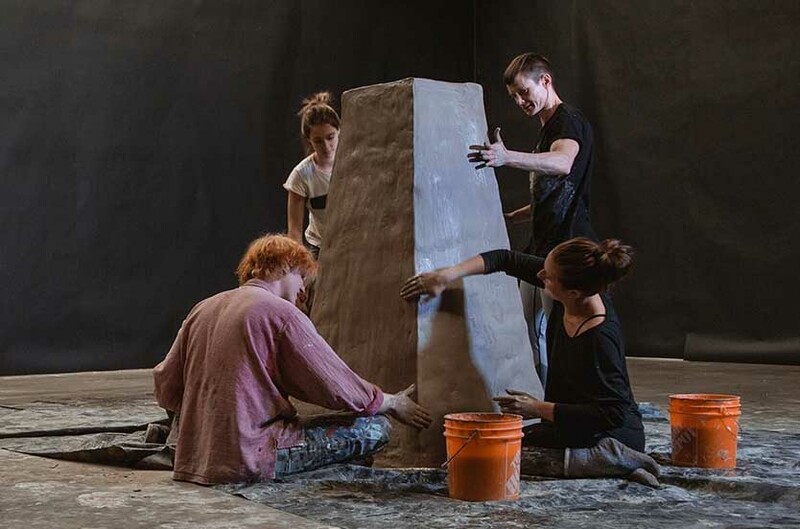 “This experience was definitely something that I am thankful for and has inspired me to move into performance art in the future,” says Brushetta. 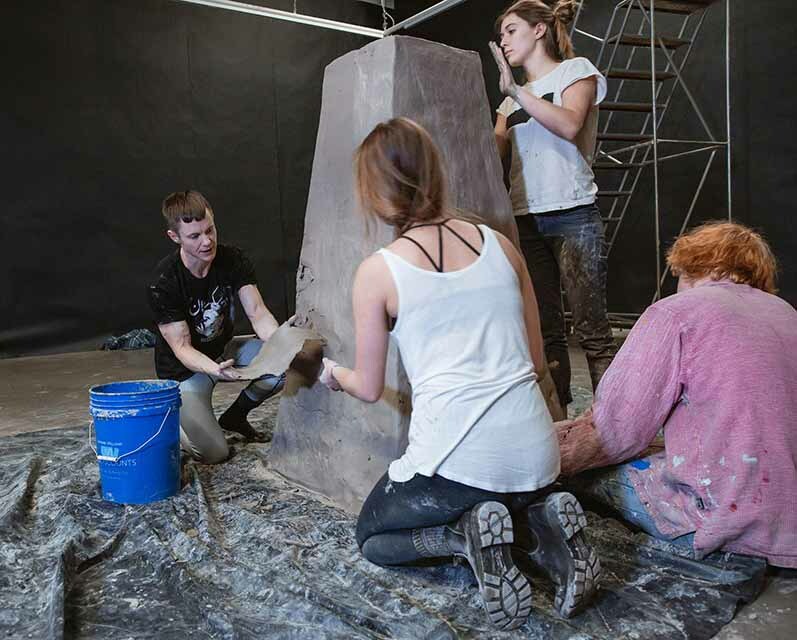 While the long-running Visiting Artist program is an important part of the Visual Arts department’s educational experience, it’s rare that students get such intimate hands-on time with an artist of Cassils’ stature. “It definitely helped open my eyes more and helped me be more creative,” says Mason. 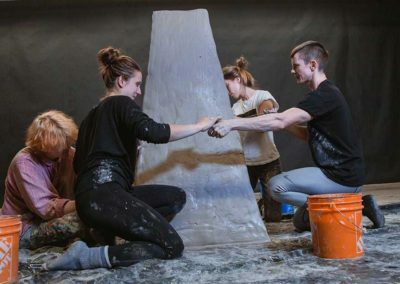 Cassils appearance at UVic was presented in collaboration with the Visual Arts department, Open Space and Legacy Art Gallery Downtown, with support from BC Arts Council, Camosun College Visual Arts, UVic Libraries, and UVic’s Chair in Transgender Studies. Cassils performance was part of the run-up to the third biennial Moving Trans History Forward conference, hosted by Transgender Studies from March 22 to 25. Approximately 300 people from the Americas, Europe and Asia converged on UVic for the conference, which also featured a keynote address celebrated Two-Spirit artist Kent Monkman, a Canadian of Cree and Irish ancestry whose work is displayed in numerous private and public collections including at the National Gallery of Canada.